ACT/NSW Country, NSW Metro and the Cricket Australia XI (CA XI) remain undefeated after two rounds of the 50-over competition at the Under 18 National Championships in Ballarat. ACT/NSW Country continued its winning ways with a comfortable seven-wicket win against Victoria Metro at Eastern Oval. A dominant performance in the field set up the win, with Gabrielle Sutcliffe (3-13) and Abby Taylor (3-27) doing the bulk of the damage with the ball to help restrict Vic Metro to 134. 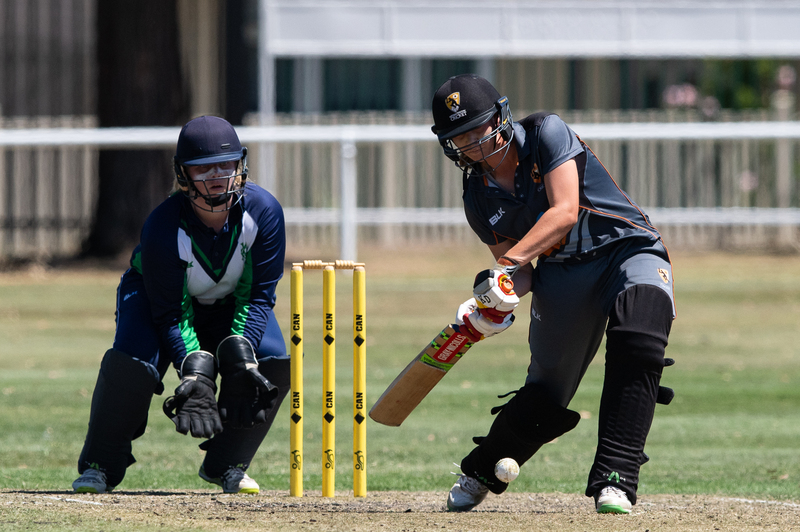 The loss of opener Alisha Bates (0) did little to disrupt ACT/NSW Country as it went about chasing down the total, with Sarah Young the star of the show with an unbeaten 66 from 89 balls. Contributions from Anita Handono (21), Jessica Davidson (18*) and Anika Learoyd (17) ensured ACT/NSW Country reached the total with 14 overs to spare. A brilliant effort with the ball from the NSW Metro bowlers set up its win, with Tasmania bowled out for 91 batting first. Spinner Isabelle Afaras (5-19) claimed the first five-wicket haul of the Championships, while Hannah Darlington (3-18) and Isabella Malgioglio (2-18) were also impressive. In reply, NSW Metro lost Maddy Darke for just two, but Sarah Turner (34) and Angelina Genford (23) got their side back on track with a 63-run partnership. Tasmania fought back, claiming four quick wickets to have NSW Metro 5-77 but it was all too late as Olivia Porter (15*) and Elise Noble (5*) steered their side past the total. The young CA XI continued their impressive run of performances with a six-wicket win against South Australia in what was a dominant showing with both bat and ball. Having won the toss, the CA XI elected to bowl first and it looked to be the right decision with South Australia 3-52 early on, Isabella Greig (2-17) claiming two top-order wickets. Rachel Church (23) and Laura Niejalke (16) combined well to add 49 runs to the total, but the dismissal of Church triggered a collapse that saw South Australia lose 5-8. Some brilliant work in the field from the CA XI resulted in three run outs, and South Australia eventually bowled out for 133. In reply the CA XI made a steady start before Kayla Burton (4) was also run out, but a 73-run partnership from Ruth Johnston (45) and Phoebe Litchfield (56*) put them back in the box seat. A late flurry of wickets was all too late for South Australia, as the CA XI reached the total in just the 25th over. The Northern Territory was also on the Day 6 winners list, overcoming Victoria Country by three wickets. Even contributions from each of the bowlers helped restrict Vic Country to 152, with opening bat Merinda Hale (49) falling one run shy of her half-century. Northern Territory opener Jessica Bradley also fell one run short of a half-century, but her innings proved vital in ensuring her side made a positive start to its run chase. After reaching 3-113, the Northern Territory stumbled somewhat losing 4-24, but cameos from Clodagh Ryall (17), Ruby Strange (13) and Kira Holmes (16) was enough to keep the scoreboard ticking over, with Gillian Chalmers (3*) and Rachel Hartung (2*) showing good patience before scoring the winning runs with just over two overs to spare. In the final match of the day, T20 premiers Queensland defeated Western Australia by six wickets. Having bowled Western Australia out for 108, Queensland made light work of the chase, reaching the total in the 21st over thanks largely to opener Ellie Johnston (33) and Charli Knott (41*) who did the bulk of the scoring.